From Bergen, drive Hwy. E-16 to Voss (about 100 km), then continue past Vinje (traffic circle) to Oppheim. Continue along the left side of lake Oppheimsvatnet, still on E-16. From the location where you leave this lake, drive about 1.5 kilometer more, then look for a road forking right with a sign reading Brandset. Take this road, continue straight (uphill) in a couple of road forks as the road climbs higher on the right hand side of the main valley. About 1.5 kilometer after the last fork, you will find a parking area on the right hand side of the road. Immediately thereafter, the road crosses a small creek on a bridge, there is a gate here. Just park at the parking lot, this is the tarilhead, location N60.77831, E006.70009, elevation about 570 meter. This area is a military range, if there is military activity, then check the route with some authorized person in order to avoid conflicts. The military seems quite friendly and helpful co-existing with outdoor activities. There are several possibilities. The most direct route on skis goes as follows: Continue on the (military) road east, until this road turns more south-east (about 750 meter). 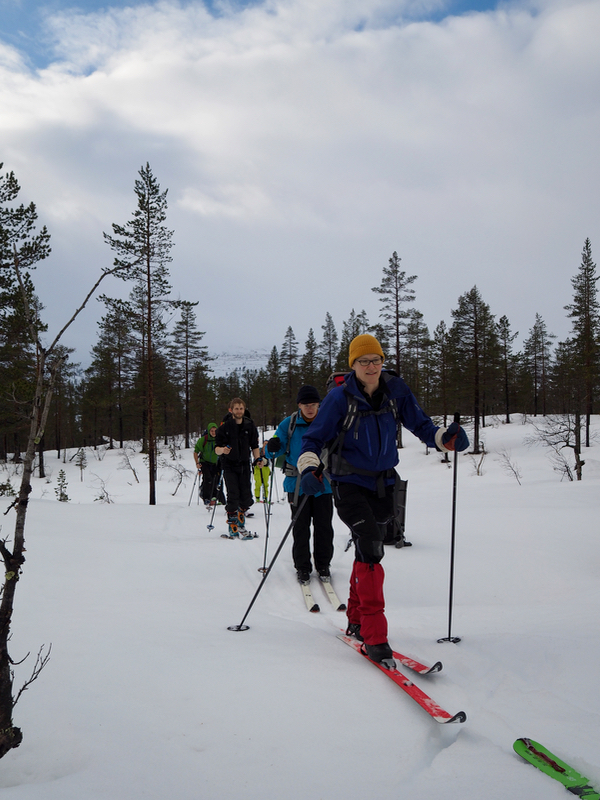 Leave the road and cross the river, continue in nice and easy terrain with pine trees north-east, passing nyestølen. Stay left (west) of the main river, Ådnakkaelvi, until about elevation 860 meter, then ascend into the big basin that gradually steepens ahead. Heading more or less directly in the direction of Kaldanuten, a good route runs uphill in a nice gully south of point 1333 (on the map). Following this, north-east to the small pond in the col south of Kaldanuten (between the two summits that both exceeds 1420 meter). 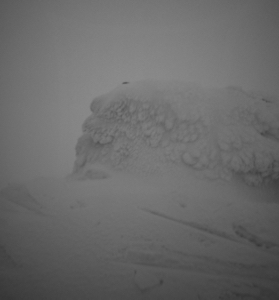 Turn north, and ski the short, remaining distance to the summit, marked with a low cairn. 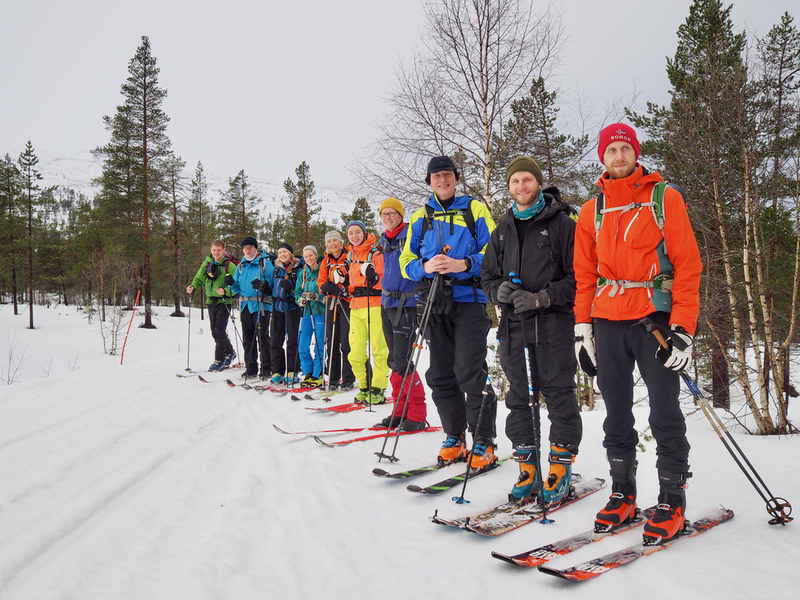 I organized and led this trip as a Bergen Mountaineering Group outing. After the normal, late cancellations (most likely due to a miserable forecast), we were a group of 12 leaving Bergen at 0800. The drive was OK, but a possible sign of trouble when we turned off the main Hwy. to access the local road serving our planned trailhead. Two MPs (In Norwegian this means military police), where stationed right there. 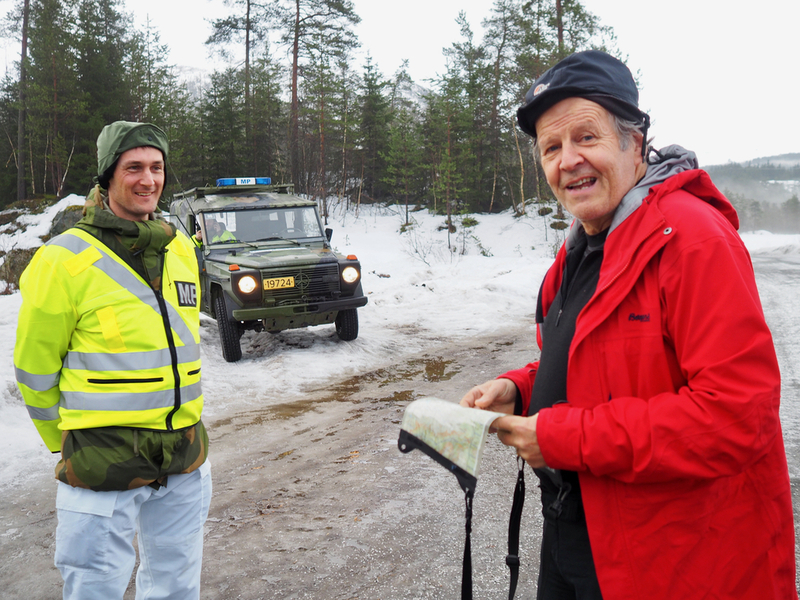 A military exercise had just started up in this mountain area and by the way, a very careful inspection of the map revealed that our planned trip was on an army training area. This surprising fact could spell trouble. I stepped out of my car with the clear intention to convince these army people that we could carry out our planned ski trip, hopefully without much interference with the army activities. Small world, as soon as I got close to this one soldier and discovered that he was a student in my (CS) department. Not only in my department, but actually a student that I needed to supervise. I smiled and told him: "You need to fix this if you want a degree", the other military personel most likely thought about military degrees, while my student got the point. He called and then reported that I should talk to the command at the next higher camp. A slight change of route after discussing this with some guy in command, and we were all happy. I told my group that I had reached a peaceful agreement with the army and that we could proceed with our ski climb. We left around 1100, this type of trip has gained in popularity, 5 female and 5 male participants, most with randonnee equipment. The trip went quite well. 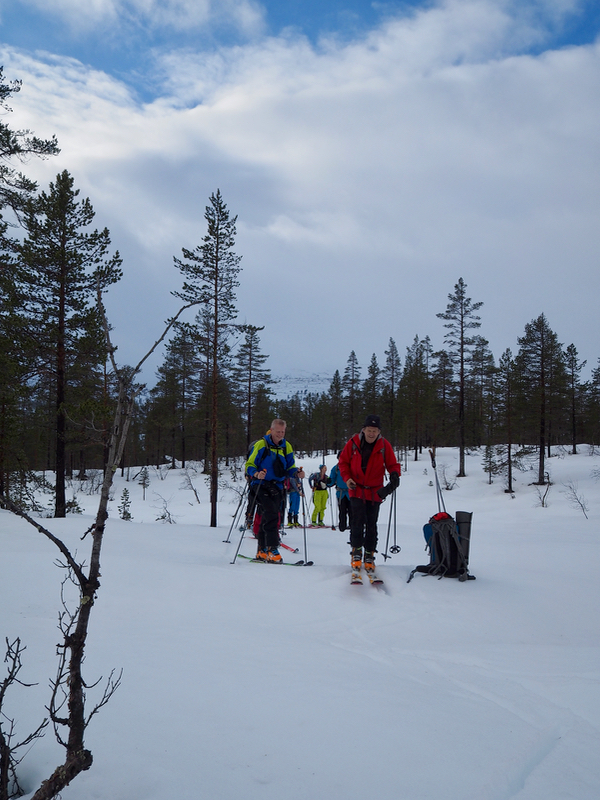 There was a brief period with sun as we skied up through nice pine forest. The conditions could remind about Easter. Wet snow and above freezing temperature. Quite a few smaller creeks to be crossed, normally at this time of year, they should hardly be visible. However, this year the snow cover is minimal and most creeks would still run in deep trenches. 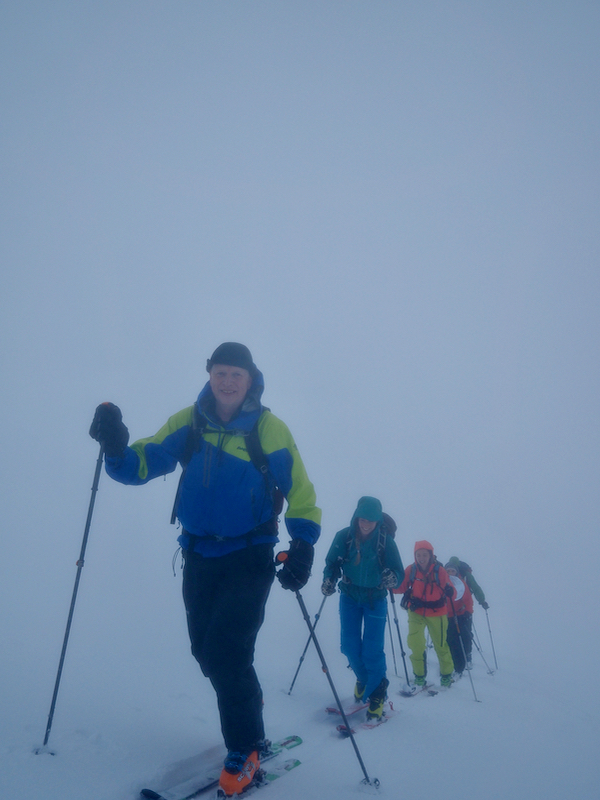 We skied uphill and into the fog, arriving at the summit around 1400, so 3 hours up. 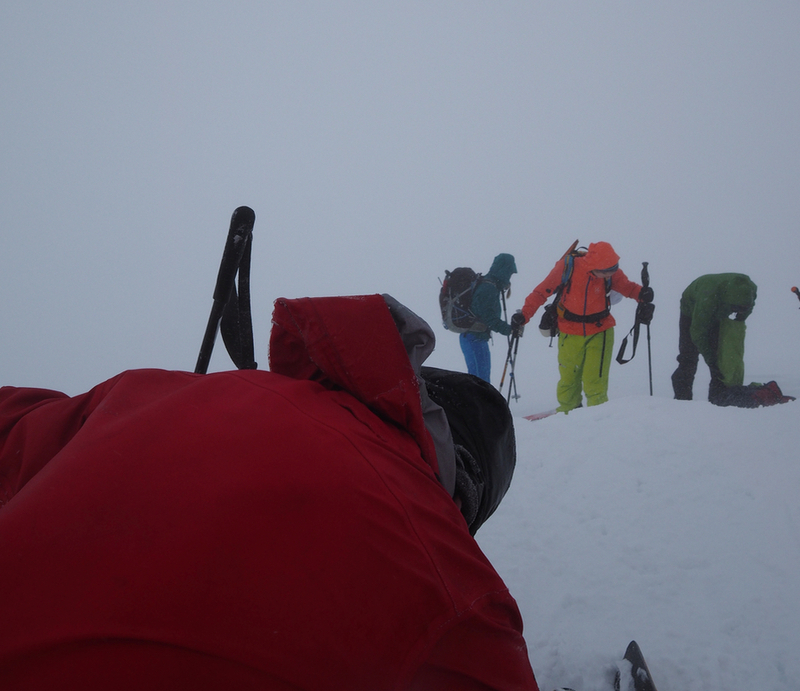 The skiing back down was heavy with about 30 centimeter of wet snow plus limited visibility due to the fog. As we descended, the view cleared and skiing became easier. Everybody back at the car by 1600. 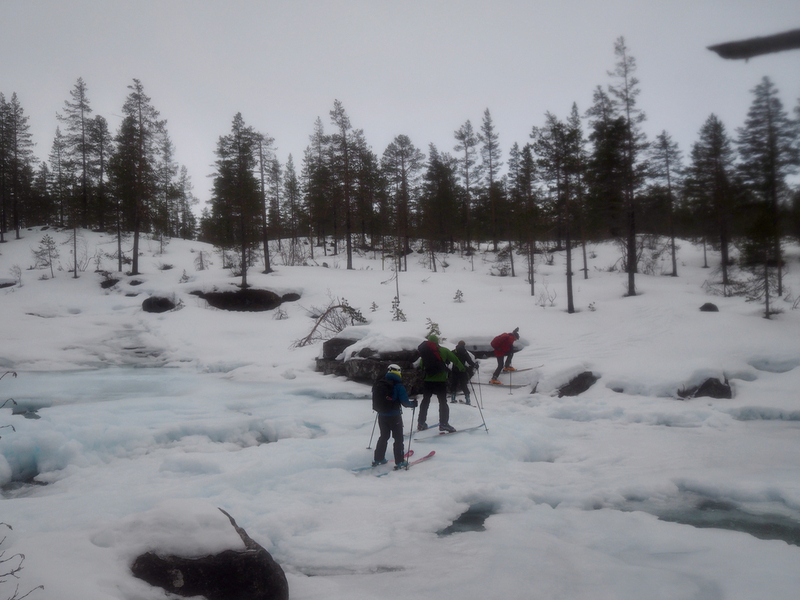 The forecast had been pretty bad, but everyone seemed to enjoy the trip and the experience. All photos on this page by Fredrik Brun.